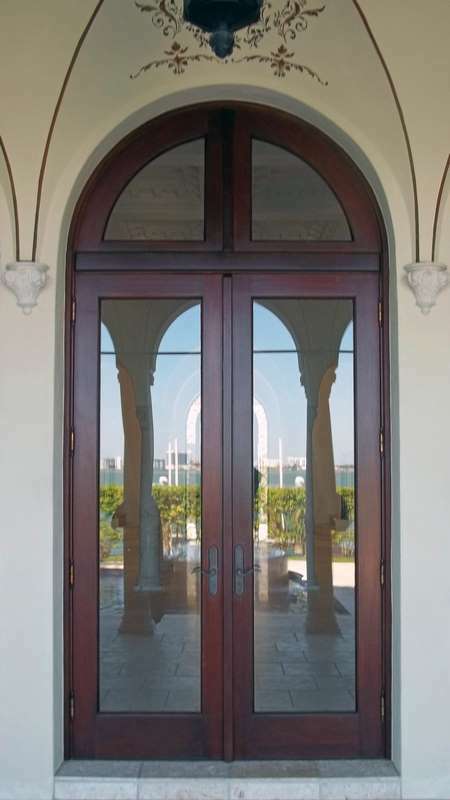 The simple and dynamic design of the Biscayne point mahogany French doors brings elegance and visual harmony to the Bay front residence. The composition of the door is manufactured with exactness and superior craftsmanship. The doors are fitted with one glass per leaf and a full arch divided transom. The French doors are manufactured utilizing select grade, genuine Honduras Mahogany procured from responsibly controlled forests. Glass: Impact resistant laminated ½” thick. Tested for water infiltration, Forced Entry, Hurricane Cycling and Impact the Mahogany French doors are code approved to protect the homes in the Coastal areas of the United States and the Caribbean Islands from the fiercest Hurricanes. The composition and strength of the "Impact Mahogany French Doors" fitted with Insulated laminated Glass will enhance insulate and protect and insulate the Home in The areas of colder climates from extreme cold weather and from attempted forced entry.